Currently the largest construction project in the world at a cost of $4 billion. 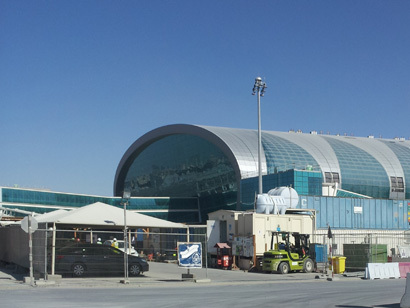 The third concourse was included in the Dubai Airport extension programme to accommodate the increased number of passengers from the new A380 superjumbo. 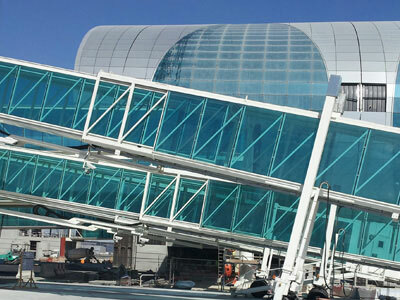 It will have 20 contact gates, of which 18 will be for the A380. 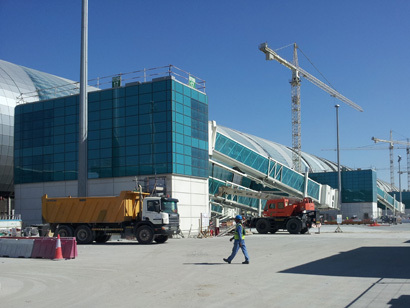 It is a fully airside structure and is connected to Terminal 3 via an automated people mover in addition to vehicular and baggage handling systems utility tunnels. Encased in its elliptical shape are 2 rectangular volumes that hold both 4 and 5 star hotels. The first and business class lounges are located on 2 separate levels below the hotel, including arrival and departure floors and a duty free area. TelTec Electrical Ltd have been involved in expediting the MEP cable containment systems throughout the building and are working at being actively involved in the testing and commissioning process as areas reach completion.